There are a multitude of current websites that inaccurately portray Margaret Sanger as a racist who wanted to sterilize certain races, based on her involvement with the Eugenics movement. Encountering this assumption, no matter how often I read or hear it, continues to frustrate me. So I was happy to see a recent article by Southern Illinois University professor of social work that examines some of these charges. 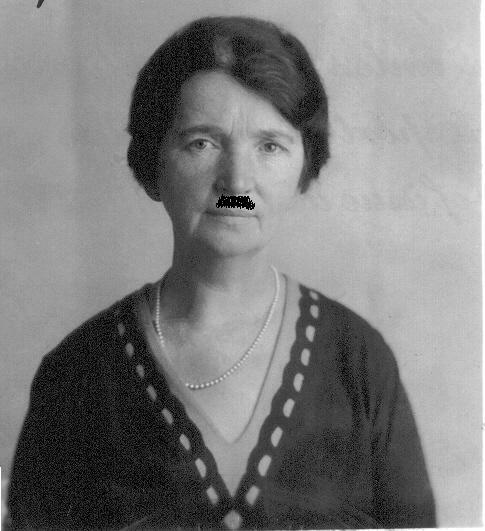 Gerald V. O’Brian’s “Margaret Sanger and the Nazis: How Many Degrees of Separation,” puts those assumptions to rest by looking at the many misconceptions associated with the “devil,” Margaret Sanger. Sanger stressed that people should reproduce only when they were mentally and economically fit to do so. Sanger’s main goal was to help people who did not want children. For many, poverty and ill health made it much more difficult to have and care for children. She sought to provide information and access to contraceptives for those individuals, but the impetus generally came from the patient. Since a majority of those unable to afford children were lower class people, including African Americans, people assume she was racist; however, this applied to ANYONE unable to mentally, physically, and economically support their children, and wanted birth control knowledge. Sanger disagreed with many in the American Eugenics movement who wanted “racially fit mothers” to reproduce as much as possible. As stated above, Sanger felt that women should have the choice to decide to procreate. Though she did not support sterilization based on race, she did agree with the Eugenics movement that people who were not mentally competent to make reproductive decisions, e.g. “morons,” (given the terminology commonly used at the time), should be sterilized. This was also a concept supported by various religious groups and even President Roosevelt..
Who’s who at the Fifth International Conference on Planned Parenthood? A few years ago, we obtained scans of a fascinating set of photographs from the family of Abraham Stone. He was the director of the Margaret Sanger Research Bureau, a vice president of the International Planned Parenthood Federation, and a close friend of Margaret Sanger. Among the rare images in the collection are photos taken at the Fifth International Planned Parenthood Conference, held October 24-29, 1955 in Tokyo, Japan. Unfortunately, the photos were not captioned, and while we can identify a few of the activists, we do not know who many of them are. Margaret Sanger is featured in many of the photographs, along with Shidzue Ishimoto Kato, the best-known Japanese birth control activist who Sanger first met in 1922. Accompanying Sanger in many photographs are Dorothy Hamilton Brush and Abraham Stone. Brush was a Cleveland birth control activist and member of the board of the Brush Foundation, and served as the editor of the IPPF’s newsletter. Some of the prominent Japanese at the meeting were Hideki Kawasaki, the Japanese Minister of Welfare, and honorary president of the meeting; Dr. Juitsu Kitaoka, who headed the Family Planning Federation of Japan and served as the Secretary-General of the meeting. Shidzue Kato chaired the Japanese Planning Committee, which also included Dr. Yoshio Koya and Dr. Kageyas W. Amano. Dr. Fumiko Amano served as the official hostess. The conference proceedings also mention the participation of the Family Planning Federation of Japan, who might also have appeared in the photographs. In addition to those already mentioned, others include its president, Dr. Yasumaro Shimojo, Dr. Kan Majima, executive director, Mr. Minoru Tachi, Mr. Kenzo Ikeda, Dr. Masako Fukuda, Dr. Kunizo Hukuda, Dr. Haruo Mizushima, Dr. Ayanori Okasaki, Dr. Shozo Toda, Dr. Masayoshi Yamaguchi, Dr. Takuma Terao, and Mr. Shinichi Mihara. The Fifth International Conference on Planned Parenthood covered issues including world population problems, and in relation to food shortages, programs for promoting family planning, a symposium on current contraceptive methods, and a session on new biological methods for controlling fertility. This last session included early research by Dr. Gregory Pincus, who a few years later, released the first birth control pill. The conference was well attended and provided a publicity boost in Japan to birth control activists working there. If you can identify any of the people in the slideshow, please do so in the comments. Thanks! One of the most dramatic tales from Sanger’s Autobiography happened one hundred years ago this month. Then one stifling mid-July day of 1912 I was summoned to a Grand Street tenement. My patient was a small, slight Russian Jewess, about twenty-eight years old, of the special cast of features to which suffering lends a madonna-like expression. The cramped three-room apartment was in a sorry state of turmoil. Jake Sachs, a truck driver scarcely older than his wife, had come home to find the three children crying and her unconscious from the effects of a self-induced abortion. He had called the nearest doctor, who in turn had sent for me. Jake’s earnings were trifling, and most of them had gone to keep the none-too-strong children clean and properly fed. But his wife’s ingenuity has helped them to save a little, and this he was glad to spend on a nurse rather than have her go to a hospital. Sanger and the doctor worked for three weeks to fight the septicemia Mrs. Sachs suffered under. Sanger noted that Jake Sachs was kind and thoughtful, and clearly loved his wife and children. When they were about to leave, Sanger reported that “as I was preparing to leave the fragile patient to take up her difficult life once more, she finally voiced her fears, ‘Another baby will finish me, I suppose?’ The doctor admitted the possibility, and noted that she must not try “any more such capers,” or she would die. It was the dawn of a new day in my life also. The doubt and questioning, the experimenting and trying were now to be put behind me. I knew I could not go back merely to keeping people alive. I went to bed, knowing that no matter what it might cost, I was finished with palliatives and superficial cures; I was resolved to seek out the root of the evil, to do something to change the destiny of mothers whose miseries were vast as the sky. Were Jake and Sadie Sachs real people? Did Sanger change their names in order to protect their privacy? Did the story really happen as Sanger wrote it, or was it fiction or a conglomeration of experiences she encountered in her years as a visiting nurse in the Lower East Side? There is no way to be sure. What is certain is that Sanger was late in telling the story, especially if it was such a pivotal experience in her life. The first appearance of the story came in 1916, during Sanger’s cross-country speaking tour. In “Woman and Birth Control,” one of her stump speeches, she related the story, noting the Grand Street address but leaving out the names. She indicated that it had happened “three years ago,” in 1913, rather than in 1912. In her 1931 autobiography, My Fight for Birth Control, Sanger spelled the family name Sacks, rather than Sachs, but provided more information about the family. Jake was 32 years old, and their children were ages 5, 3, and 1. We could not locate the Sachs family in the 1910 census, on Grand Street or anywhere else in Manhattan. But we did locate Jacob and Sarah Sacks, who in 1910 lived on 105 Attorney Street in the Lower East Side, only a few blocks from Grand Street. Both were from Russia, they had three children, Joseph (5), Harry (3), and Dora, who was one and a half. The family does not appear in the 1920 census, with or without Sadie. Who’s who at the Brownsville birth control clinic trial? This iconic photo shown above features Margaret Sanger, surrounded by colleagues and supporters, emerging from the Brooklyn Court of Special Sessions during the Brownsville Clinic trials of Margaret Sanger, Fania Mindell and Ethel Higgins Byrne on January 7, 1917. The trial received widespread media attention as it heard arguments about the legality of the first birth control clinic ever opened in America. 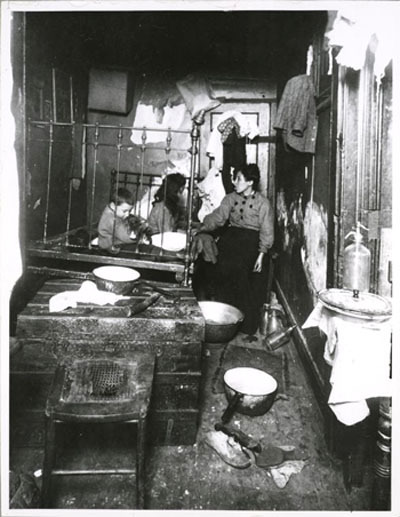 The clinic, which Margaret Sanger opened at 46 Amboy Street in the Brownsville section of Brooklyn, was raided and closed after being open only nine days. Featured in this photo along with Sanger are some of the progressive women of the era. We have been only able to identify a few of the people pictured. Can you help us identify the rest? Please leave suggestions in the comment section below! The woman standing behind Rose Halpern with her eyes closed under her hat is probably Ethel Byrne (#16), Sanger’s sister, who was also arrested in the Brownsville Clinic and later imprisoned in Blackwell’s Island workhouse. Following the example of the English suffragettes, she went on a hunger strike, fasting for five days before being force-fed through a tube by the prison staff. She was released from prison after eleven days and granted pardon after Sanger negotiated with New York governor Charles Whitman. 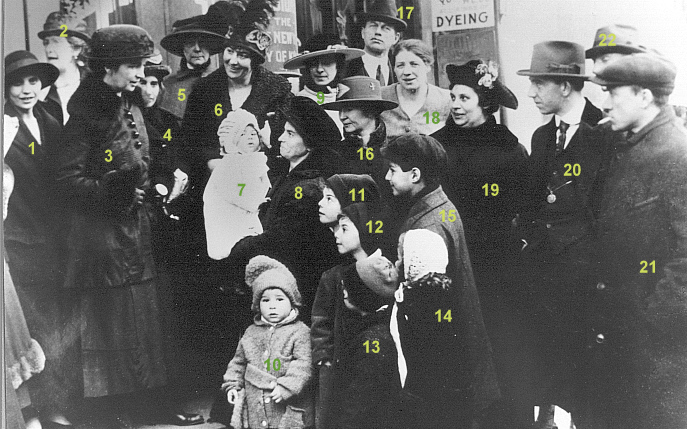 The woman standing in the middle of the crowd facing Sanger with flowers on her hat is Bella Zilberman (#6) of 919 Avenue O, Brooklyn, a social activist, peace advocate, and supporter of Sanger. A New York Tribune piece from the trial mentions her criticizing the judges decision to jail Sanger and her colleagues, and supporting Sanger’s theories about family limitation. We have found another version of this image online at www.corbisimages.com that shows even more spectators. Can you help us figure out who any of the others are? Do you recognize any of the faces? For more information, check out more images from this day at www.corbisphotos.com. “Why Don’t They” make plates of materials that can be eaten like ice cream cones instead of bread. It would save washing plates and could be non-fattening. When we found this letter we could make neither heads nor tails of it! We had a good laugh at old Mrs. Sanger’s expense, imagining her dictating her idea to a confused but obedient secretary. It is telling that she signed her name as Margaret Slee, her married name which she used primarily for private affairs. Clearly these ice cream cones plates were not to be associated with the birth control movement! EQUIP typewriters with a key that, when depressed, automatically underscores as you type? This would save the typist the time and energy it takes to backspace and undersscore. —Shirley Shupe, Ogden, Utah. HAVE a master lock on the car driver ‘s door which will lock the other doors too? This will prevent children from unlocking doors from the inside, and make it easier to lock up the automobile when leaving.—Mrs. David Hagerman, Whitney Point, N.Y. MANUFACTURE cigarettes which would produce various colors of smoke when lighted—just to break the monotony?— Fredric A. Honold, Manitowoc, Wis. Some of these ideas predicted developments, such as the underscore key and the master lock, that we enjoy today. Can you imagine living without such conveniences? Colored cigarette smoke remains wishful thinking. Some ideas, like Sanger’s ice cream cone plates, never made it into the magazine. But that doesn’t mean that they cannot be realized. We found that Italian entrepreneur Tiziano Vicentini recently invented edible plates! In addition to being slightly absurd, this archival find suggests what an playful imagination Margaret Sanger had, even in the last decade of her life.